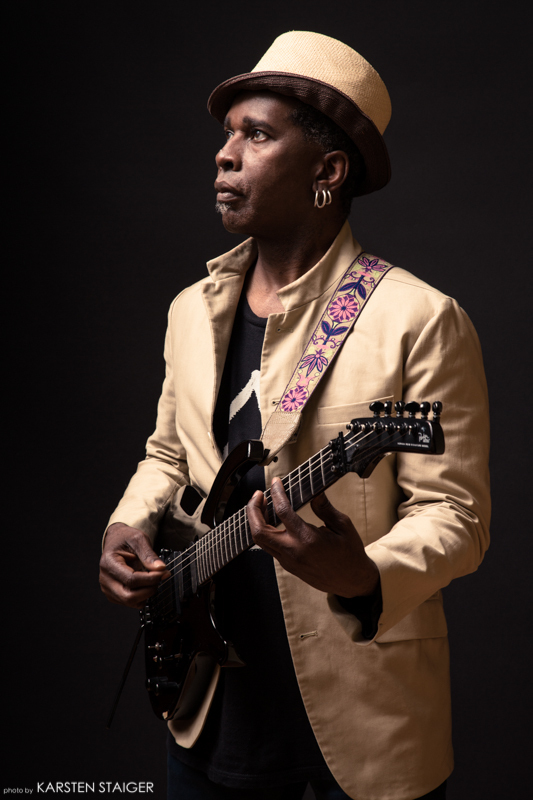 When you hear the name Vernon Reid, your first thought is probably of his work with Living Colour, featuring his speedy and inventive guitar playing. But Reid is also an accomplished composer, scoring for films and TV, and he enjoys talking about gear and technology. Audiofanzine recently had a chance to chat with Reid about those subjects and more. First of all, what's the status of the new Living Colour album? It’s in process. We’re mixing. So you're getting relatively close to finishing? One would hope so. [laughs] I shall be evasive on that point. The record's called Shade. It's several things. One part is looking at blues as an influence. We’ve also been working with this producer named Andre Betts, who’s music is more urban. It's an interesting collision of things. For example, we recorded a cover version of the Biggie Smalls song "Who Shot Ya,” And, it kind of came about because, Corey [lead singer Corey Glover] is a big Biggie Smalls fan. He would always do the line, and I just said, why don't we record that. And then we did it, but instead of rapping it, he sings it. Blues was something that you were thinking about when you were doing the album? Yeah. We recorded a version of Preachin’ Blues, the Robert Johnson song. We recorded it on the centennial of Robert Johnson's birth. It was coincidental. Other than that one, were there any other blues tunes on the album? We have about three or four originals. There are also three covers, we do "Who Shot Ya," "Preachin' Blues" and then we do "Kick Out the Jams.” "Kick out the Jams" is little punkish, but it's also got a blues vibe too. How does the record compare musically to previous stuff the band has done? All of the records are very different from one another, in a way. All the records are all over the map. They’re very diverse, you have everything from heavy rock or metal to funk. It's all different sorts of stuff. And this record's very similar. But one of the originals is called "Whose That?" and it's got this great cameo from Big Sam, a trombonist from New Orleans. He's on it and Roosevelt Collier, whose this great lap steel player, he plays one of the solos. I hesitate to say that it's blues-rock, it's really kind of not that, but that was definitely an influence on the record. You've done lot of composing work? So you must have a nice home setup? [laughs] I don't know how nice it is. But it works, it's functioning. It's kind of a mad scientist's laboratory. Ableton Live. There are a couple of other things that I use, but the primary DAW I use for stuff is Ableton Live. Did you choose it in part for its ability to trigger loops, or was it for some other reason? The thing is, I've been using Ableton from the very first version. The evolution of Ableton has been astonishing. And I think, for me, I think it's one of the most exciting [applications], and allows you to be extraordinarily experimental. There are a few things that Ableton doesn't have, but I'm able to do things really quickly in it. It sounds pretty great — especially this version, version 9.14, we're up to now. And I like that it integrated Cycling '74 Max for Live. It's absolutely revolutionary. I was a Cubase guy, and I used [Cycling '74 ] Pluggo, and all that stuff, back in the day. And also, I use a lot of Native Instruments stuff, including Guitar Rig, Reaktor, and Kontakt. The Kontakt libraries are outstanding. They allow you to do a lot of great stuff. When Live started supporting video, that was the thing that clicked it for me. So you could do your scoring projects in it? Live has the Arrangement View, which is kind of like a typical DAW in a lot of ways, and it's got the Session View, where you can launch clips. Do you use that one a lot? 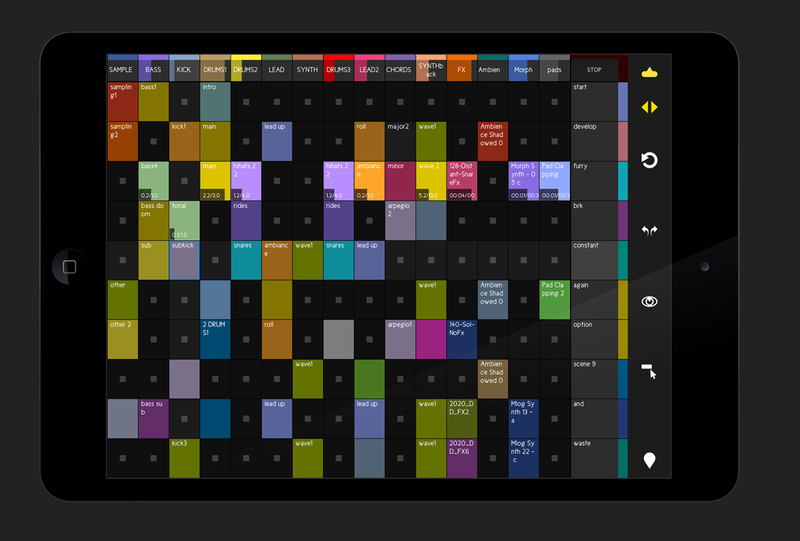 The iPad app touchAble is one of the Ableton Live controllers that Reid has been experimenting with. Which for scoring is important. It's totally essential. To be able to drop markers on-the-fly is a big deal. There are some hardware things, in partnership with the DAW that make it really great. Have you used any of the iPad-based controllers for Live? I'm still experimenting with them. I have been using an [Akai] APC-40 and a [Novation] Launchpad. There's a DAW controller called touchAble, that’s pretty cool. There's one called LiveControl that's also okay. There's also Lemur. The virtual version of Lemur, which is incredible. The virtual version of Lemur has like 20 different Ableton Live control patches. Yeah, for an iPad app it's expensive. It's funny how things that seem expensive for an iPad would be considered dirt cheap for Mac or PC. I think that's what turned my head around about it. An app costs 99 cents and people complain if it's $2.99. So it's weird — the scale of things. If you go out and buy Sushi, you pay $30. And that $30 is gone, once you've spent it, and once you've ate it. I recently bought the Arturia iMini, an amazing Minimoog emulation on the iPad for only $9.99! Yeah, there's some great things. I’m actually a Mac-based person. I think that the integration of iOS into OS X is actually making things very exciting. Do you like the touch screen more than the mouse? It's different. If it's well designed you stop thinking of it as a touch screen, and you just interact with the objects. That's the funny thing about human beings and technology, the thing that was a once unimaginable is now commonplace, and when it's commonplace, you don't think about it. Like I'm walking around talking to you holding an iPad mini. After I talk to you, I could say, "OK, I’m going to open up touchAble. And I could open up Ableton and do a thing. Or I could plug my guitar into it and play guitar. Or watch a movie or play one of the many video games I'm addicted to. And they didn't have these in Star Trek. That's what's so bonkers about predictions of the future. I remember when I got the first iPad, I said to my self, "Well, this is the first thing that feels like it arrived just on time." A lot of what we see is really prosaic. And you know the whole thing that's happening with virtual guitar, and the advances with pitch to MIDI. There are a couple of pitch-to-MIDI apps on the iPad. You can plug your guitar in — and it's pretty much monophonic, and there's one that's weirdly polyphonic — and I have no idea how they do it. The tracking's not bad. You plug your guitar into something like the Sonuus i2M. It's this great little USB device that allows you to not only have pitch to MIDI, but it's an audio interface. You plug it into the camera kit [Lightning- or 30-pin-to-USB adapter], and you could be playing a synthesizer, and you could assign this app to play another app. It's crazy. And that's before getting into Inter-App Audio and Audiobus. In other words your iPad can become a complex effect machine. It's very interesting what's happened with that. And now we all take it for granted in a way. It's strange. That is really strange. And I kind of feel that it's very important — certainly in terms of production, in terms of thinking about music or creating music — to keep the wow in your life. You've got to keep some amount of the awe, maybe without the shock. You can lose the shock and keep the awe. You mentioned Guitar Rig. Do you use it mainly for demo type stuff, or do you get final guitar track sounds recording DI and then using Guitar Rig? It depends. I'll put a mic up to an amp and record that way. 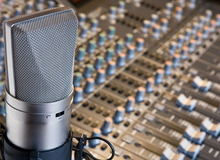 Certainly if I'm playing acoustic guitar or playing banjo for a track, I'll put up a mic. Increasingly, the emulations have become amazing. There's a whole separate cabinet emulation thing. There's a software called Recabinet. It's fantastic. Say I use any one of a number of virtual ways to play guitar. I could use Guitar Rig or the Zoom stuff or the Roland stuff or the Boss stuff, all of which I have. Or AmpliTube, which is fantastic — I can get really great stuff going on. But Recabinet has incredibly detailed emulations of cabinets. There's a whole other level of tonal variations I can get. 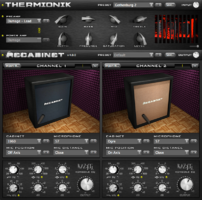 Once I record the guitar, however I've done it, I insert Recabinet. Recabinet is very very realistic. And then suddenly, something that sounds okay sounds great. 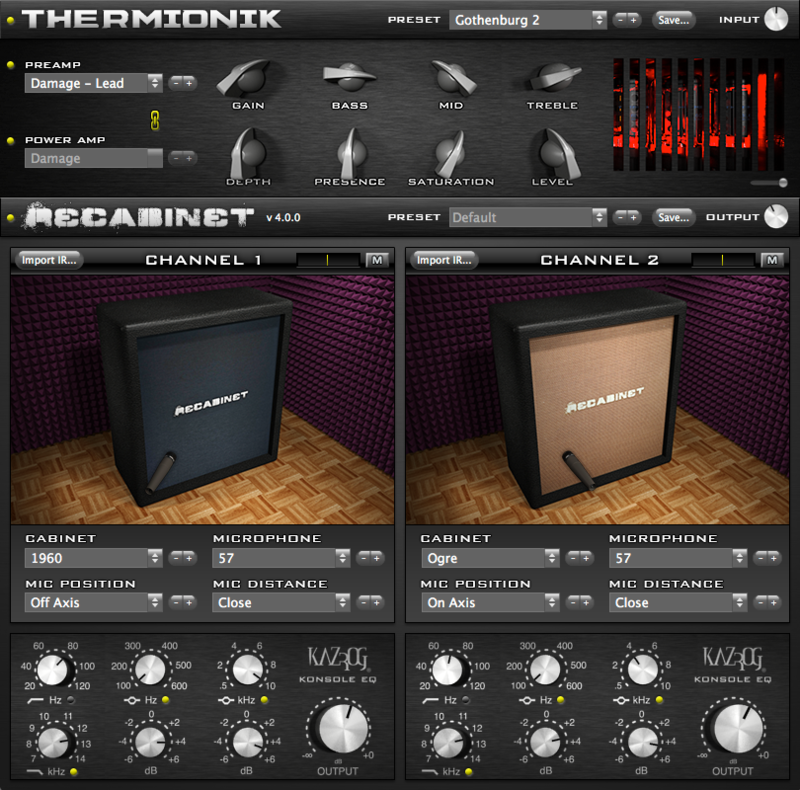 Reid often uses Recabinet, a virtual cabinet plug-in, on his guitar tracks. Let's talk about your composing work. What kind of projects are you doing? I'm doing a bunch of indie film stuff, documentaries, that sort of stuff. The whole deadline aspect of a scoring job can be very intense. It's less insane on indie films than doing something for TV. But I did a theme song for a TV show for Fox, and that was kind of “nail-bitish,” but it wasn't terrible. To do it day in and day out, I don't know. I want to do creative stuff. I'm an artist. I think that's an interesting thing. On the one hand there's the professionals that do a job, a solid job. And this is really not to denigrate it, but that's music as furniture. On one level it’s sort of like Jimi Hendrix at Monterey Pop becomes a track on a towel commercial. This is the weird thing about it. How do you approach the music for a scoring job? You don't want things to stick out. But if something underscores the project really well, it really becomes part of the fabric of the thing. It's like those two notes in Jaws. Or the whistle from The Good, the Bad and the Ugly. And that's the curious thing about composing, that one detail. Everything else can happen, but that one detail, that one thing that seems to stick out is the thing that people remember. The thing that's so strange is that there's a proliferation of so much library music. And there's so much classical music, and all of that stuff is now in the public domain. Some of the early 20th-century stuff is in the public domain. And we've got situations now where you can take things that pre-exist, and just randomize it. You could randomize it within certain parameters, and you've got a brand new piece. Whose to say it's not? And I'm not saying that people are shucking and jiving, but the whip hand of deadlines can force people into exactly that. The weird thing about it is, if you have a lot of clever, desperate people that all have the same libraries, there's a potential for, "Hey wait a minute, didn't I just hear that cue?" Let's talk about guitar playing. Your playing is really exceptional. Who were your big influences? There are a lot. I started playing guitar because of hearing Carlos Santana, and then Jimi Hendrix blew my mind. And then Robert Fripp kind of twisted what was left, B.B. King brought me back to life, I was murdered by T-Bone Walker, and then Allan Holdsworth kicked me to the curb. I'd be remiss without saying that John McGlaughlin and the Mahavishnu Orchestra was a huge, huge, huge influence. And then there were neighborhood guys. Guys who people won't know. Like Andre LaSalle and Larry Marsden. And really the biggest influence of the local heroes was Arthur Rhames. Last night I went out and saw Steve Arrington who's a legendary R&B and funk singer. He was a member of Slave, and he also had a band called Steve Arrington's Hall of Fame. And at a certain point in the concert, he mentioned Arthur Rhames. Because Arthur is a guy from my neighborhood who joined his band. And I would be remiss without mentioning the late, great Johnny Winter who just such an important voice. And there are a half a dozen other people that I'll hang up and say, "Damn, I should have mentioned so and so." Guys I think the world of, there’s a gang of them: Dave Fuzinski, Reeves Gabrels who played with David Bowie. Lonnie Drayton who's an influence and still a contemporary guy. Alex Skolnick, who's one of my heroes, he's the guitarist with Testament, but is also a really fine jazz guitarists. Ben Monder, who's beyond outstanding. "Captain" Kirk Douglas, guitar player for the Roots, who I think is a fireball, a complete fireball. Those are some of the guys I look onto, and Ben Tyree is another one who I think is fantastic.